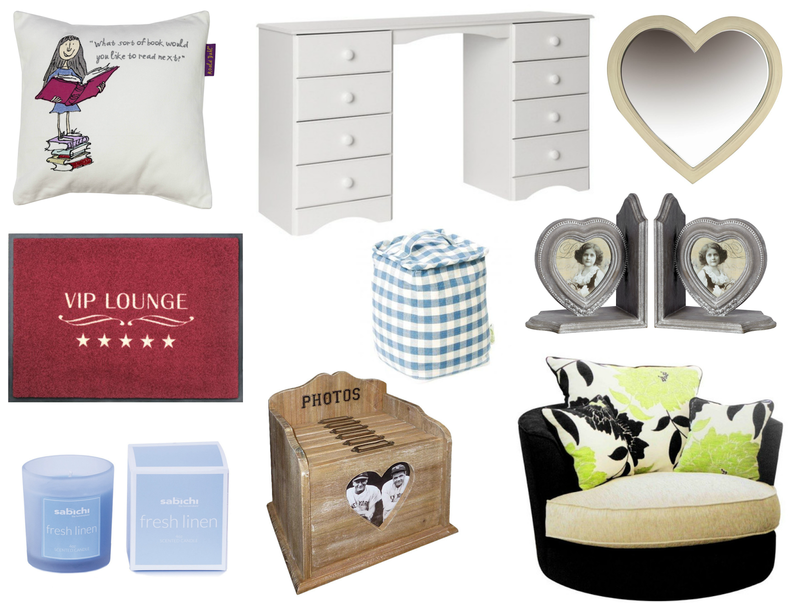 Since moving out (and even before then really) I have become obsessed with homeware and home accessories. Even if I don't buy loads you'll catch me staring at them and internet window hopping a hell of a lot! An online company introduced to me recently is Wayfair. "A zillion things home" is their tagline and I have to say they do not dissapoint, there really seems to be a zillion things!! So many products, so many designs there is 100% something for everyone, no matter what decor you desire or have! I have spent hours looking through this site, honestly I think it's time I re-thought my non-exsitent career and went into interior design - it would be so fun! I've pulled a few of my favourite picks from the site and made a snazzy little wishlist for you all! Look how cute their stuff is! Keep reading to find out how to win an amazing £150 giftcard to spend yourself at Wayfair UK! After over a year of living together my boyfriend & I still have the crappy doormat which came with our flat! Everytime I come home nd stare at it and think ewww boring! Now this is cool - I love it! This chair would look so cute in my bedroom, the perfect chair to cosy up on with a good book, a blanket and a cup of tea this winter! I love the green accents, would love a matching duvet set too! This just reminded me of Dorothy from the Wizard Of Oz and as you all know it is one of my favourite movies ever, tote fits in with my blog theme aswell so couldn't leave it out! I seriously need more doorstops in my flat I'm fed up of keeping things open with random items! I'm a candle addict, I hate horrible smells I swear my nose is so sensitive so I love having candle and diffusers to keep everything smelling nice! Fresh Linen sounds lovely, like clean sheets on the bed - one of my favourite things! I just found this so so cute! If like me you were brought up around the genius work of Rohld Dahl like me you will appricate this! There's not just Matilda either there's a whole range of the cushions! These would look so cute in a child's (or my) bedroom! So the inner blogger came out in my when I saw this! With a big mirror places on top an all the storage space either side, this would be the perfect make-up application dresser! I love the one I have at the moment but there just isn't enough room for all my stuff - I need to look at upgrading to something larger! You can't have a home without mirrors! (and no I'm not vain!) I love this simple wooden heart mirror, so pretty for any room! This is a lovely idea, my photos are all shoved n boxes somewhere, this is such a cute box and a great way of organising! You could have each section as a different year or maybe a different holiday of event! I love organisational things like this, I'd happily spend hours sorting through photos and memories! I'm a big book lover and even though I have a kindle now so tend to get them on there for convenience I still have so so many books cluttering up my life. (Although there's noway I'll be getting rid of any!) I love the way they look and these book ends would really complete a book shelf! And now your chance to win win win! Wayfair have been kind enough to give me a £150 giftcard to give away to one of you lovely dedicated A Yellow Brick Blog babies! This is open to the UK and Ireland only and the winner must be able to provide their name, email   address and postal address upon winning. I totally get lost on the wayfair site all the time. We're currently doing up ahouse stuck in the 70s so it all needs work. Our next job are the bathrooms. So whilst it's not the most glamorous way to spend money I'd probably buy things like luxury towels so that every bath and shower felt think we we staying in a hotel! What a lovely giveaway, I love your wishlist especially the tub chair!! I would really like the bird bath/feeder with solar light and planter.I love birds and lights in the garden and this combines both. I love wayfair they have some fantastic things. I've got my eye on a new oak chest of drawers for my bedroom. Thanks for the lovely giveaway. I'd love the Home Essence Retro Funky Mania Multi Novelty Rug for our conservatory! Thanks! I love the Home Essence Mosaic Glass Mini Egg Table Lamps, particularly the Amber and Black ones. What a great giveaway, thanks for holding it! I reallyl like the wooden photobox. Going through old photos is one of my favourite ways to fill the time at home, remembering old holidays and houses, and having them in a beautiful box rather than just piled into drawers would be much better! Id love to get the Birdcage ceiling light for my room! It would look so pretty. I think I would really struggle to decide as there are so many nice things on the website! I love love love all the Catherine Lansfield bedding sets! I'm currently wanting to refurb my bedroom into something chic and relaxing. This stunning Ivory arm chair would be a dream to get! We need a small cupboard/cabinet for the hallway! Lots and lots and lots of candles! I don't know why bu I've always had a strange obsession with homeware stuff, can't wait until I can get my hands on my own place to decorate to my hearts content! I need that Matilda pillow! Though all the other Quentin Blake-illustration pillows are amazing as well. I've just moved into a new place and would love to make my room a little cosier with pillows, cute storage solutions and lighting (I have a thing for Tiffany lamps and they have a lovely selection!). I would get some bits and bobs for the kitchen! I would absolutely love the Tidy Books bookcase as I'm home educating my son and we have so many books that need a home. I'd love a new desk for my daughter, so many nice ones not sure which I would choose. The altruna dressing table is just beautiful! The Kantha Patchwork Arm Chair! This is an amaaazing giveaway. I'm re-doing my house atm so would love to win. I really would love a pair of Caress plus latex pillows. Would love to get some lovely new bedding for the colder months! It's such a tough choice! I can't wait to move out so I can start buying all these lovely things! I have to say I have my eye on that tub chair too, have wanted one for ages! the Zandra Rhodes Vader Duvet Set is stunning!!! I love the tub chair, it would look so good in my bedroom. I love the Stag Cushion by Alan Symonds! It would go perfectly in my bedroom! Wow, what a fab giveaway. I love all the items, but that chair is amazing. Like you, cosy up with a good book and cuppa. I would love one of the lovely stripey rugs. Would love a slow cooker and some nice furnishings for the living room! I'd like the Altruna Dressing Table! The Nevada 3 Piece Nest of Tables would just look lovely in my livingroom. I love the signature minimalist duvet set. A new cutlery set. I am in need of a good one for special occasions and they have some lovely sets on their website. I think it might take me a while to choose a specific one though. Really need some new bedding! Love the Egg Mosaic Lamp - it would look great in my living room!! I would get these gorgeous curtains for my living room. Hubby broke the lid on out current bread bin tonight so would be ideal. Would love a new rug for my daughters room! There's too many things to choose from, but we really need a side cabinet for our lounge. A rug would be lovely! So many things in the Home Furnishings dept which take my fancy!